Bíonn uisce an Domhain de shíor ag gluaiseacht. Is é timthriall an uisce (nó an timthriall hidreolaíoch mar a thugtar air uaireanta) a chuireann síos ar shíorghluaiseacht an uisce ar dhromchla an Domhain, os cionn an dromchla, agus thíos faoi. Bíonn staid an uisce á hathrú de shíor idir leacht, gal, agus leac oighir. Tarlaíonn na próisis sin i bhfaiteadh na súl agus thar na milliúin bliain. Féach an chairt thíos chun míniú garbh a fháil ar na háiteanna ina bhfuil uisce an Domhain. 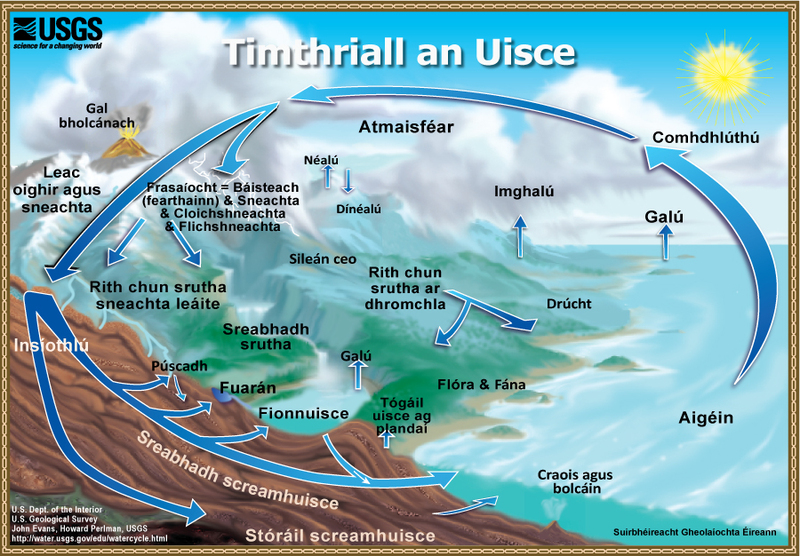 Faoin am seo, tuigeann tú go gcuireann timthriall an uisce síos ar ghluaiseacht uisce an Domhain. Mar sin, tuigfidh tú go léirítear uisce an Domhain ar phointe ar leith sa chairt agus sa tábla thíos.Má sheiceálann tú arís i gceann míle nó milliún bliain, is dócha go mbeidh athrú tagtha ar na huimhreacha seo! Tá thart ar 1385.9 milliún ciliméadar ciúbach uisce ar domhan ar an iomlán, ach tabhair faoi deara gur sáile é breis is 96 faoin gcéad den uisce sin. Anuas air sin, tá breis is 68 faoin gcéad den fhionnuisce gafa i leac oighir agus in oighearshruthanna. Tá 30 faoin gcéad eile den fhionnuisce sa talamh. Níl ach thart ar 93,100 ciliméadar ciúbach uisce (22,300 míle ciúbach) le fáil i bhfoinsí fionnuisce dromchla amhail aibhneacha agus lochanna. Níl ansin ach thart ar an 1/150ú cuid d'aon faoin gcéad den uisce iomlán. Ach is ó aibhneacha agus ó lochanna a fhaightear mórchuid an uisce a úsáideann daoine gach aon lá. Cá bhfuil uisce an Domhain? Féach an tábla sonraí thíos chun míniú mionsonraithe a fháil ar na háiteanna ina bhfuil uisce an Domhain. Tá thart ar 1386 milliún ciliméadar ciúbach uisce (333 milliún míle ciúbach) ar domhan ar an iomlán, ach tabhair faoi deara gur sáile é breis is 96 faoin gcéad den uisce sin. Anuas air sin, tá breis is 68 faoin gcéad den fhionnuisce gafa i leac oighir agus in oighearshruthanna. Tá 30 faoin gcéad eile den fhionnuisce sa talamh. Dá bhrí sin, níl ach thart ar 93,100 ciliméadar ciúbach uisce dromchla (22,300 míle ciúbach) le fáil in aibhneacha agus lochanna do dhaoine. Níl ansin ach tuairim is 0.007 faoin gcéad den uisce iomlán, ach tá aibhneacha agus lochanna ar na foinsí is mó den uisce a bhíonn in úsáid againn. Foinse: Caibidil le Igor Shiklomanov "World fresh water resources" in Peter H. Gleick (eagarthóir), 1993, Water in Crisis: A Guide to the World's Fresh Water Resources (Oxford University Press, Nua-Eabhrac).